We have frequently commented on the importance of migration channels linking specific towns in Mexico to particular places in the USA. 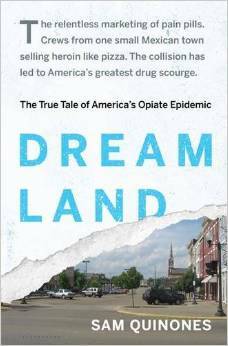 In his latest book, Dreamland: The True Tale of America’s Opiate Epidemic, journalist Sam Quinones, one of our favorite writers about Mexico, describes the fascinating details of how one particular migration channel – from the small, nondescript town of Xalisco in the western state of Nayarit, to the city of Denver – has fueled an innovative delivery network for black tar heroin, a network that now spreads its tentacles across much of the USA. Indeed they were, and the system they had set up was enterprising, innovative, and designed to avoid undue attention. Sam Quinones’ latest book is a gripping account of many previously murky aspects of the U.S. drug scene. It should interest anyone who wants to understand the human stories behind drug trafficking, international migration and globalization. A must-read! This is a very interesting subject, and the reviews for the book are very good, thanks very much. Very interesting post….and the excerpt has fascinating details about the person to person, tightly organized delivery system in Denver.